The widespread use of DDT based pesticides decimated the osprey population in the US, and globally between 1950 and 1975. The ingested pesticide compromised the birds reproductive system, with the result being infertile or thin-shelled eggs. Growing up in the UK, I remember talking about how great it would be to see an osprey before they became extinct. Since the ban of DDT products in the early 1970s the osprey population has recovered and this stunning raptor is once again widespread, and co-existing in harmony with humans. The osprey is a large member of the hawk family, growing to 23 inches (58 cm) with a wingspan of up to 71 inches (180 cm) and weighs in at around 3lb (1.4Kg). They can live for up to 25 years but more commonly survive for 15 to 20 years. Some specimens in the US can cover over 160,000 miles during the migration between North and South America. 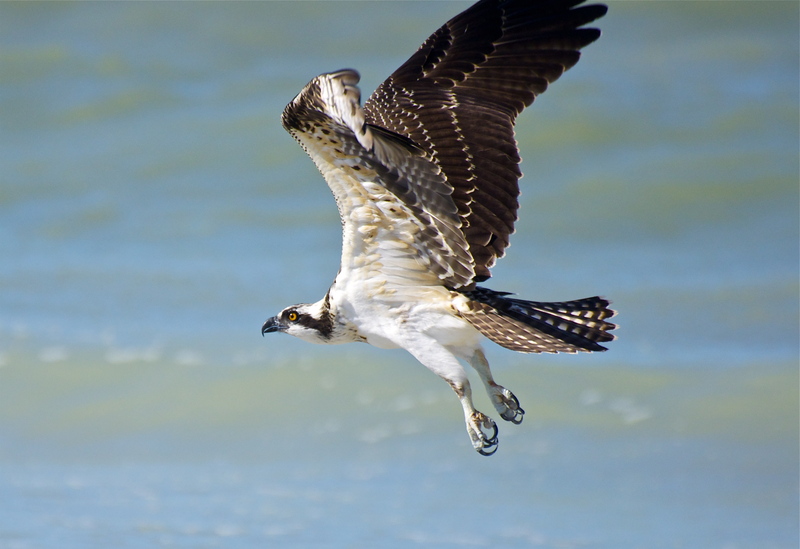 Ospreys are resident year round in Florida and the southern states bordering the Gulf of Mexico, where fish are always plentiful. Also known as the Fish hawk, it is a widespread bird, living on every continent except for Antarctica. I saw my first ospreys, from a distance, in Australia, but in North America the bird is a poster child for what can be seen by an incidental naturalist. The magnificent birds shown in these images were photographed on Sanibel and Captiva islands in Florida during a family holiday. The bird shown in the image from Lighthouse Beach (below) was happy to pose, not just for my 300 mm zoom but also for a few sizzling sunbathers, who gave him instant Facebook fame with their smart phone snaps. The first sign of their presence was the large, clumsy nest of sticks that sits on top of the over-road sign that spans McGregor Boulevard on the approach to Sanibel Island. From the moment that we entered the causeway bridge, osprey were a constant companion, seen circling above roads, sea, beaches, lakes and fields. 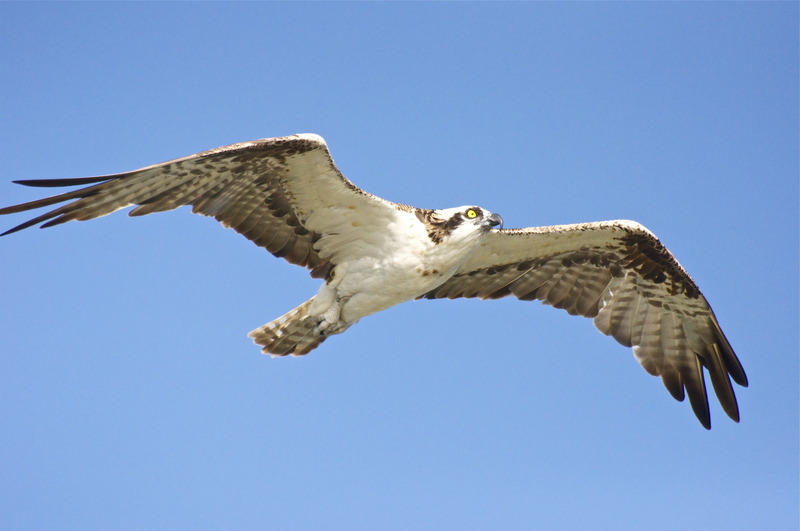 Ospreys build nests on high, flat platforms that allow for 360 degree vision. 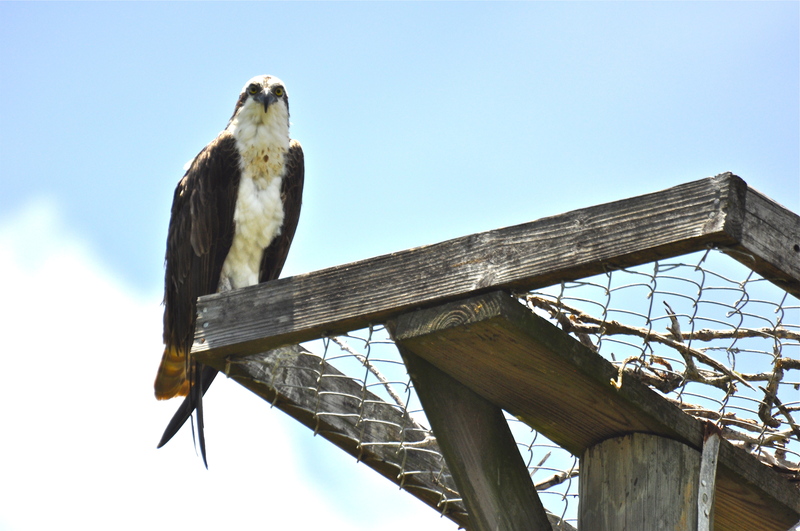 This offers protection from ground predators such as raccoon and enables them to defend themselves from air attacks by Bald eagles, which can swoop from the blind side to grab osprey chicks. On Sanibel, their nests were spotted on man-made nesting stations, building roof tops, power poles and trees as well as the one on top of the road sign. I was hugely impressed to see so many man-made platforms in the wildlife refuges, on beaches and in urban areas, all of which appeared to be in use, or being inspected by an osprey. Ospreys feed almost exclusively on fresh fish, which they catch themselves by swooping over shallow waters and grasping fish using their razor sharp talons. 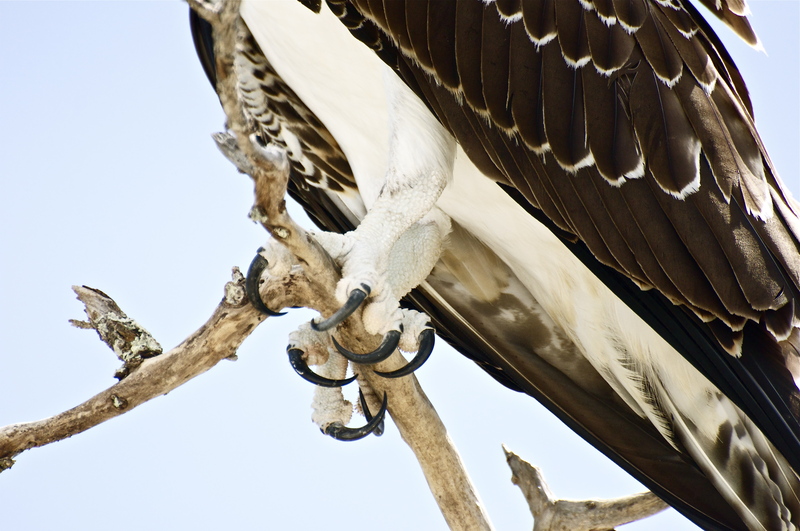 As with owls, the talons have a reversible toe that enables them to grip a fish using two toes in front and two toes behind the catch, as they pluck it from the water. They are incredibly efficient fish hunters with recorded success rates of 70% of dives resulting in a catch. In March, I witnessed a young osprey feeding on the carcass of a Canada goose that was released by thawing ice in New Jersey. This is uncommon feeding behaviour and the result of an early migration and a long winter. 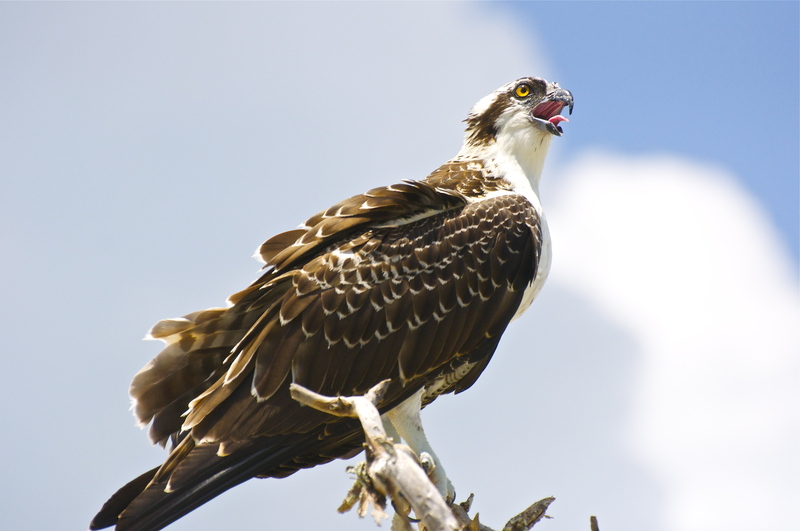 Success stories such as the return of the osprey show what can be achieved when humans focus on the preservation of habitats and manage the use of chemicals that negatively impact habitats and infiltrate food chains. We have even been able to support breeding programs by developing successful nesting stations. I live in hope that we can continue to build from such successes, and bring back many of the other species that we have pushed to the brink. Look for osprey around any large body of water that has a good head of fish, close to the surface. I found them to be extremely common in Florida, but have also seen them in numbers in New Jersey and driving between New York and Connecticut, where they often fly over the road with a fish dangling from needle sharp claws. It is always a privilege to see such magnificent raptors. Comments or feedback welcomed, below. yes, we have them here too, in BC. Magnificent birds, huge wingspan . . .
Man, I never knew that Ospreys had almost gone extinct! Here in Florida, (I know quite well the places that you referenced) they are as usual a sight as the seagulls and crows that like to haunt our parking lots. My dad has watched chases between ospreys and bald eagles over one little fish, with interesting results. The ospreys will sometimes turn on the eagle! It is quite magnificent. Great post! Ospreys are also avery common on the North Carolina coast. On a recent visit to Corolla, NC we saw no less than four nesting pairs just from our hotel window. Had the privilege to watch them bring sticks for building a nest and take the remains of a fish from the nest. The carcass was returned to the water some way away from the nest. Another stunning set of pictures of a beautiful bird. I’ve heard a little of the sad case of their demise in the UK but it’s great to hear that they are making a comeback. Thanks Jane! I saw my first osprey in Aus, nesting off the coast of Port Douglas and also at hunting at Ballina. I’m always happy to see them and was thrilled to get so close to so many in Florida.